Interlocking pavers for pedestrian applications. 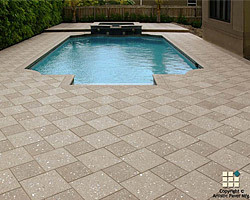 Steplock® pavers are designed for pedestrian applications including patios, swimming pool decks, lanais, walkways and more. 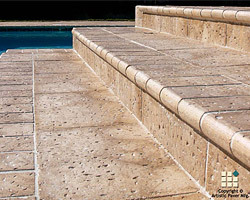 Steplock® pavers and coping are also excellent for architectural and decorative uses, including raised walls, pool coping, steps, spillways, fountains, planters and benches. Artistic Paver's coordinating deck pavers, coping and specialty pieces not only give your project a great look, but they also make an easy sand-set installation, saving you time and money. 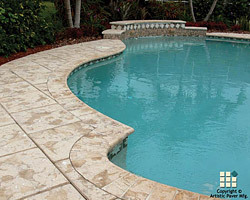 Seashells mixed into the paver & honed to expose the beauty of the seashells. 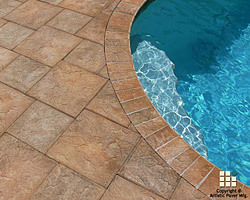 The distinguished look and texture of coral made durable. The rustic look of stone with all the benefits of pavers. A cut stone look in an elegant aged paver. 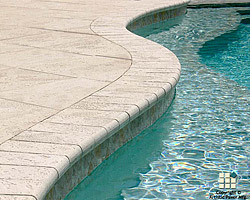 A unique style that merges the beauty of the Old World with Shellock seashell pavers. Artistic Paver's Roadlock® Atlantic Series Driveway Pavers will enrich your driveway with their beauty, durability and ease of maintenance. Designed to meet the technical requirements for a driveway, Roadlock® also has the advantages and versatility of sand-set, interlocking pavers. Because Roadlock® driveway pavers are uniform in shape and calibrated to a thickness of 2-3/8", they install easily in a sand base. This very dense, nonporous product can be installed in any climate and is resistant to salt erosion, secondary efflorescence, staining, algae and mildew growth. Roadlock® Atlantic Series has exposed and polished shells and aggregates in earth tone colors in a range of sizes for residential and commercial projects. 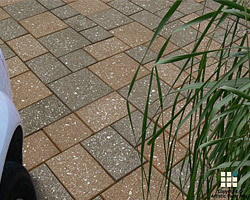 Roadlock® driveway pavers come in 8"x8", 8"x12" and 12"x12" sizes. Mix and match colors and sizes to create a unique look for any project.